I'm a big fan of the "Game of Thrones" TV series but until recently, I had no interest in reading the "Song of Ice and Fire" books. They're all like a thousand pages long, I figured, and there are so many characters to keep straight. Plus, when the TV show's so good, why do I need to read the books? But when season 3 ended a few months ago and I was still eager for more, I decided the books might be worth a shot. Although the length was still intimidating and I already knew the plot and characters from watching the TV show, I'm happy to say that I really enjoyed this first book. To be honest, I assumed the writing would be bad. I never read fantasy and I made an uninformed assumption. 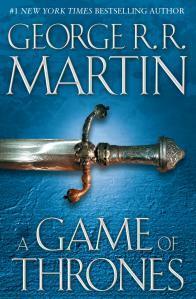 But I like the writing and I love the complex world Martin has created. Although it did get a little boring occasionally (because I always knew what was coming), I really liked getting a more in-depth look at the characters. Mostly though, I'm glad that I now have a better understanding of the plot. Despite being a big fan of the TV show, I'll admit that I'm often confused. There are just so many characters to keep track of! Now that I've read the book, I (pretty much) feel like I know who everyone is, how they're connected, their history, and their motivations. Although I'll probably wait awhile (since this book took me about 3 weeks to finish), I definitely plan to continue reading the series. VERDICT: 4/5 stars. Loved it. I'm excited to read the rest of the series.